The statue of the Crowned Virgin in the heart of the Lourdes Sanctuary. Between 24th and 31st August 2012 the British Province of Carmelites made its annual pilgrimage to Lourdes with the Catholic Association. A wide selection of photos from the pilgrimage will later be viewable on the Province's Flickr webpages. The pastoral theme for pilgrimages in 2012, proposed by the Lourdes Sanctuaries, was 'With Bernadette, praying the Rosary'. A number of trees decorated with pilgrims' rosaries were on display near the Crowned Virgin statue. Today the British Province of Carmelites began its annual pilgrimage to Our Lady's shrine in Lourdes, as part of the Catholic Association. Lourdes is the largest site of Marian pilgrimage in Europe. This is the fifth year in which the Carmelites have taken part in the pilgrimage organised by the Catholic Association (C.A. for short) which first began bringing pilgrims to the Pyrenean shrine in 1901. 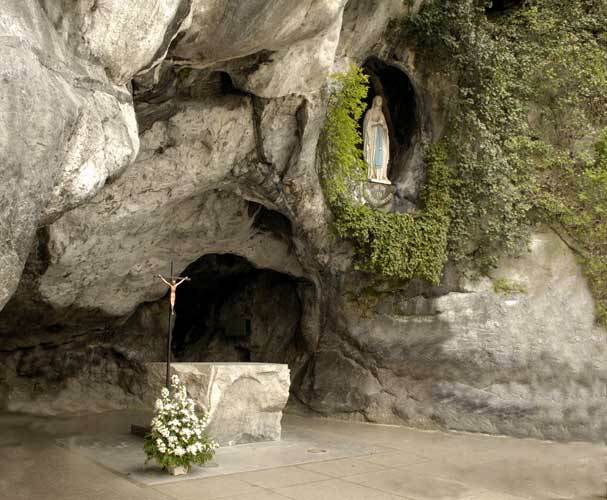 The Grotto in Lourdes is the heart of what is now one of the world's most important religious sanctuaries. 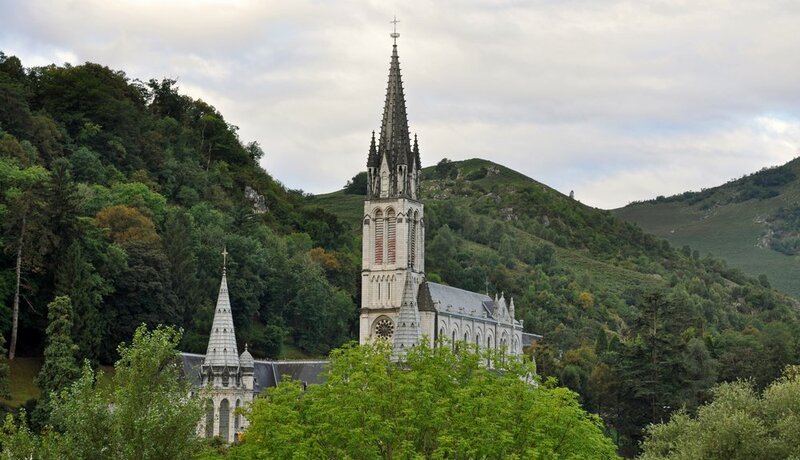 The role of Lourdes as a major place of pilgrimage began in 1858 when the Blessed Virgin Mary appeared to a young woman, Bernadette Soubirous. Since then it has developed a particular reputation as a place of physical and spiritual healing. The pilgrimage begins well before pilgrims arrive in Lourdes with months of preparation and planning. The Carmelites help prepare for the pilgrimage in various ways, including by hosting the helpers' preparation day in June. When August finally comes round some pilgrims travel out to France a week ahead of the Catholic Association as part of what is known as the 'Stage Group' to volunteer for the Sanctuary. Most Carmelite volunteers do their week of 'Stage' service in May; these travelled out the day before the C.A. to help set-up facilities for the pilgrimage. Thus it was that early on the morning of Thursday 23rd August a small advance party from the British Province of Carmelites set out from the Carmelite-served parish of English Martyrs Catholic Church in the south London suburb of Walworth. of Carmelite friars and laity across London. At St. Pancras International Station the Carmelite advance party boarded the Eurostar train. The station was specially decorated for the Paralympic Games about to start in London. 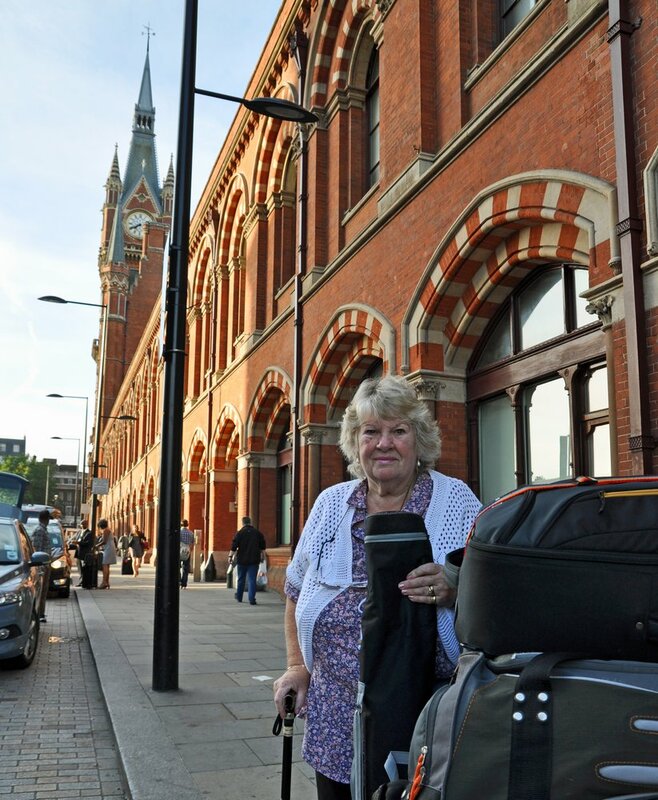 outside St. Pancras railway station. Travelling from London to Lourdes by Eurostar and TGV trains is a full day's journey, but a restful one. Angela Bergström-Allen, Shell Roca and (photographer) Johan Bergström-Allen. On the morning of Friday 24th August the advance party members of the Carmelite group coordinated the Catholic Association's access to the Accueil Notre Dame, the specially designed 'House of Welcome' for the sick and disabled at the heart of the Lourdes Sanctuary. The Accueil Notre Dame is home to the Catholic Association's Assisted Pilgrims throughout the week in Lourdes. The Accueil is not a hotel, nor a hospital, but a sort of respite home specially designed for use by the sick and disabled. The Accueil's roof-top terrace has wonderful views of the Grotto and basilicas. Members of the Carmelite group awaiting the arrival of supplies at the Accueil. Before the main body of pilgrims arrive, there is the major task of setting-up the Accueil to be done. 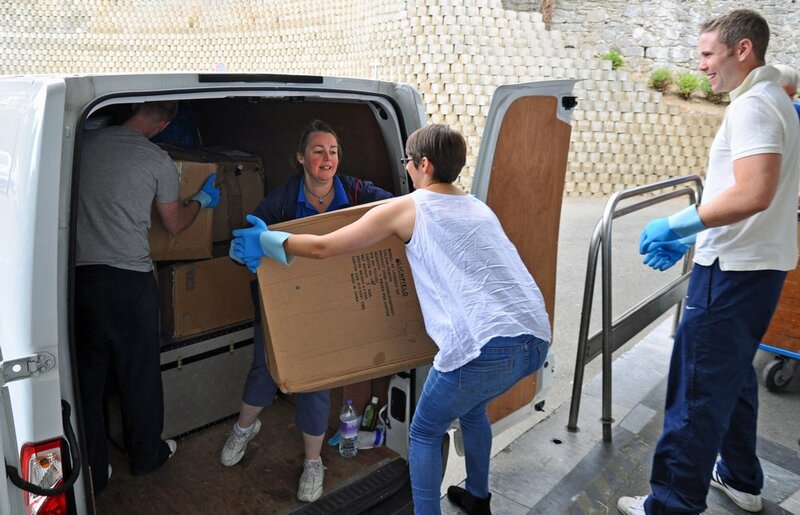 A van bringing provisions from Britain was unloaded, before picking up equipment that remains stored in Lourdes throughout the year. Unloading the equipment from the van. As well as housing some 45 'Assisted Pilgrims' of the Catholic Association who are sick and disabled, the Accueil is effectively the headquarters of the C.A. Pilgrimage, which numbers approximately 800 people in total, including about 150 Assisted Pilgrims staying in hotels across Lourdes, the 'Glanfield Group' of sick and disabled children, and over 300 volunteer helpers. To welcome all those people as best as possible, a lot of equipment is needed, everything from moving-and-handling gear and antibacterial hand gel, to tea-bags and fruit cake! Gently does it! Because the equipment is entering a building that is a cross between a hotel, a hospital and a care-home, every box has to be disinfected first! The young pilgrimage volunteers undertake the hard work with a lot of humour. Unfortunately a member of the Carmelite group suffered the first minor accident of the pilgrimage! Unloading a box of supplies, Brother Gerard (Ged) Walsh found that some cleaning products had leaked; fortunately Ged was fine, but his clothes took on interesting new shades of colour! Pilgrimage can be a dangerous business! By lunchtime everything was in place to welcome the pilgrims from the UK. The first to arrive were members of Clifton Diocese who had come from Bristol on a Jumbulance, a bus specially adapted for sick people operated by The Across Trust. At about the same time some coaches from England dropped off Catholic Association young helpers who had boarded the previous day at Cambridge and London and travelled overnight. The rest of the pilgrimage arrived by air from London Stansted and Birmingham, and by rail from London and Kent via Paris. For the earlier arrivals, Mass was celebrated in the Accueil Notre Dame by long-standing C.A. volunteer Fr. Nicholas King, S.J. He was joined at the altar by the new Chaplain to the Sick, Carmelite friar Fr. Antony Lester. As Chaplain to the Sick it was Fr. Tony's role throughout the week to serve the spiritual needs of the Assisted Pilgrims on the Catholic Association Pilgrimage, as well as their helpers. Fr. Nicholas preaching in the chapel of the Accueil Notre Dame. Fr. Nicholas and the congregation offering prayers of intercession. At the end of a busy first day, Brother Ged Walsh, O.Carm., led night prayers on the prairie meadow opposite the Grotto. The Grotto at night is a place which naturally encourages a sense of prayer. Ged invited pilgrims to light candles and reflect on their prayer intentions for the week ahead. Catholic Association pilgrims at Night Prayer. Pilgrims praying together by candle light. To read about the following day please click here. The Saturday morning of the Catholic Association pilgrimage week in Lourdes is devoted to practical matters. A number of helpers' meetings were held at the Accueil Notre Dame. The first was for new members of the Catholic Association Hospitalité, that is, the confraternity (religious society) for helpers. The C.A. Hospitalité undertakes much of the practical care of pilgrims in Lourdes, and provides its members with practical and spiritual formation, and social networking. After serving in Lourdes for a certain number of years, helpers on the pilgrimage can apply to join the C.A. Hospitalité as 'ordinary' or 'full' members. The first meeting at the Accueil was for those making their commitment this year as members of the Hospitalité. receiving a briefing on the roof of the Accueil building in the Sanctuary. Over 300 volunteers make the pilgrimage possible. Their briefing on the first morning took place in the Accueil dining room. The Catholic Association is a pilgrimage organisation in its own right, but it operates in partnership with a number of dioceses and groups who come together as one pilgrimage under the C.A. banner in order to offer more opportunities for bringing the sick and disabled to Lourdes. On the first full day of the pilgrimage many of these groups and dioceses met to discuss the week ahead. of the Carmelite group pilgrimage during a meeting at the Hotel Solitude. The pilgrimage officially opens with a Gathering Mass, which this year was celebrated in the St.Bernadette Church. Every year the Catholic Association pilgrimage is 'led' by one of its various groups or diocese. This year the leadership of the pilgrimage was entrusted to Clifton Diocese. The principal celebrant at the Gathering Mass was the Bishop of Clifton, Rt. Rev. Declan Lang. Bishop Declan Lang of Clifton Diocese preaching at the Gathering Mass. for the deaf and hard-of-hearing. During the Gathering Mass there is an opportunity for helpers serving others on the pilgrimage to have their hands anointed with oil as a sign of God's blessing on their work. by Bishop Peter Doyle of Northampton. having her hands anointed for service. The anointing is a symbol that during the pilgrimage the helpers will be reaching out with Christ's healing touch to others, and will be encountering Christ in others. Monsignor Tony Rogers of East Anglia Diocese. Even the very youngest pilgrims can help serve others in Lourdes. After Holy Communion the pilgrimage heads of service (Chief Medical Officer, Chief Nurse, Chief Brancardier and Chief Handmaid) who coordinate the helpers came forward to welcome new ordinary and full members of the Catholic Association Hospitalité. to welcome new members of the Hospitalité. Membership of the Hospitalité is shown by wearing a small insignia badge bearing the crest of the Catholic Association. These were blessed by the Patron of the Hospitalité, Rt. Rev. Peter Doyle, Bishop of Northampton. The new members of the Hospitalité were called forward. Those admitted as 'ordinary' members have completed at least one pilgrimage with the Catholic Association; those admitted as 'full' members have to have completed a further two years, proving their dedication to serving other pilgrims. 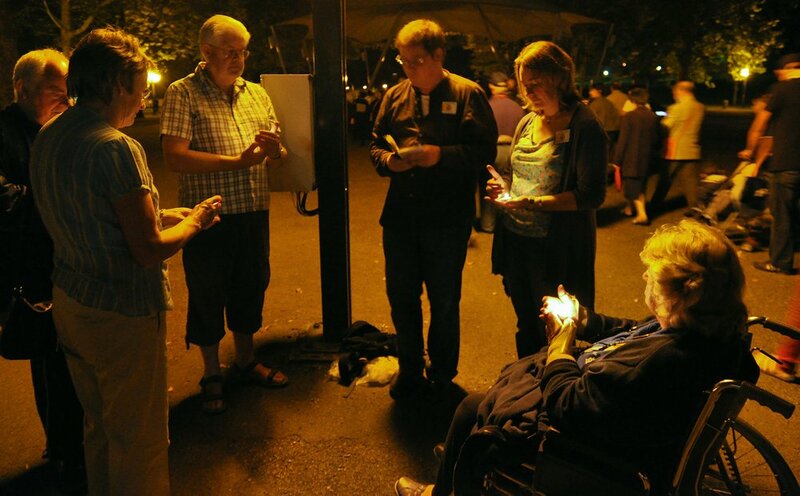 By joining the Hospitalité, members commit to come back to Lourdes with the C.A. in the future, as often as they are able. Mark Fernandes receiving his insignia as a member of the C.A. Hospitalité. A particular delight for the Carmelite group within the Catholic Association pilgrimage was seeing a number of Carmelite pilgrims making their commitment as full members of the C.A. Hospitalité. being called forward to become full members of the C.A. Hospitalité. New and full members of the Hospitalité making their act of consecration, promising to serve fellow pilgrims in Lourdes, and the sick and disabled in their home environment. 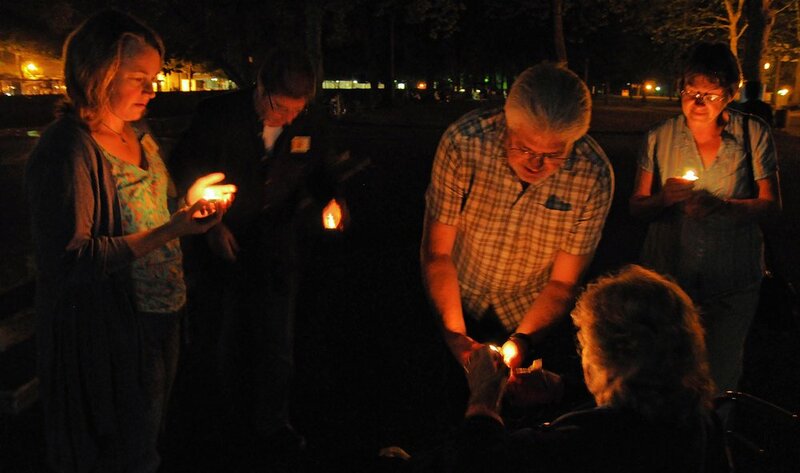 Hospitalité members committing themselves to serve in Lourdes and at home. New members of the Hospitalité being presented to the pilgrimage congregation. The new C.A. Hospitalité members received a warm round of applause. Pilgrims at prayer in the Gathering Mass. A see of blue! Members of the C.A. Hospitalité at the Gathering Mass. Carmelite-served parish of English Martyrs, Walworth. After Mass pilgrims went back to their hotels or the Accueil Notre Dame to continue settling in. in the Accueil Notre Dame. Brother Gerard Walsh, Shell Roca, Sophie Morgan. Brother Tony doing quality control on the tea trolley in the Acceuil Notre Dame! and to plan ahead for the next part of the pilgrimage. On Saturday evening the Catholic Association took part in the Torchlight Marian Procession. Every day in Lourdes there is a Blessed Sacrament Procession in the afternoon, and a Torchlight Marian Procession in the evening, fulfilling the request that Our Lady made to St. Bernadette in 1858 that people should come to Lourdes in procession. The Catholic Association was given the privilege of carrying the statue of Our Lady in the Torchlight Procession (and the less glamorous but equally necessary task of providing some crowd control for the tens of thousands of pilgrims present in Lourdes that evening). in forming a 'human chain' to direct the Torchlight Marian Procession. in the Torchlight Marian Procession. Banners lining up for the Procession. Undaunted by rain, the C.A. pilgrims line up for the Torchlight Marian Procession. Catholic Association helpers alongside the statue of Our Lady. on the first full evening of the pilgrimage. To read about the previous day please click here. On Sunday morning the Crowned Virgin statue in the middle of the Sanctuary of Our Lady of Lourdes was bathed in glorious sunshine as Carmelites and other Catholic Association pilgrims gathered for the International Mass in the underground basilica of St. Pius X. The Crowned Virgin statue - a rallying point throughout the C.A. pilgrimage - was even more beautiful than usual in the morning sunshine. C.A. pilgrims processing to International Mass on Sunday morning. Down in the basilica itself the Carmelite banner joined those from the other groups and dioceses that make up the C.A. pilgrimage, and hundreds of flags representing Christians from around the world. The Carmelite and C.A. banners lining up in the underground basilica. and is built to look like an upturned boat (a symbol of the Church). Particularly nice for Carmelites is the fact that the underground basilica's banner display of saints includes the Carmelite nun St. Edith Stein and the prophet Elijah, inspiration for the Carmelite way of life. Hundreds of priests processing into the International Mass. at the distribution of Holy Communion at International Mass. Young helpers preparing to help at Communion time. Children and young adults raising their hands in prayer at the 'Our Father'. The International Mass is a very impressive sight, but for those who find the crowd too large there are some alternative celebrations of the Eucharist. One of the most popular is that held by the HCP group. HCP stands for "Helpers' Children's Programme", and this group offers a baby-sitting service for the sons and daughters of volunteer helpers on the pilgrimage. HCP organises activities for the different age groups. Fr. John Warrington blessing children at the HCP Mass. On Sunday afternoon the Catholic Association pilgrimage took part in the Blessed Sacrament Procession, one of the two processions that takes place in the Lourdes Sanctuary every day. Pilgrims lining up on the Rosary Esplanade for the Blessed Sacrament Procession. Here are some photos of our own shambles this year! Carmelite group pilgrims awaiting the start of the Blessed Sacrament Procession: Brother Gerard Walsh, Shell Roca, Fr. Antony Lester. Carmelite friars Tony O'Donnell and Gerard Walsh in conversation. The Chief Brancardier (helpers' coordinator) of the Catholic Association is a Carmelite group member, Matthew Betts. His mother Jean Saunders kindly carries the banner for our Carmelite group every year. The Blessed Sacrament Procession arriving at the Rosary Basilica steps. Members of the Helpers' Children's Programme (HCP) processing. Members of HCP and Fr. Tony Lester (wearing the cross of a Lourdes 'Chaplain of Honour') in procession. The procession is a reminder that we are part of a universal, international Church. Carmelites and Jesuits processing together. Young helpers from the C.A. acted as servers during the procession. Bishop Paul Hendricks blessing the pilgrims with the Blessed Sacrament. Bishop Paul blessing all pilgrims at the end of the procession. On Sunday evening the young helpers on the pilgrimage were invited to a prayer service at the lake on the edge of Lourdes. As the sun set they gathered at the waterside for a short time of reflection. About 130 people gathered at the Lac de Lourdes for the youth service. of the young helpers group in Lourdes this year. Chaplain to the Sick and Hospitalité is also Chaplain to the Young Helpers. of thanks and encouragement to the young helpers. Monday morning saw the Catholic Association going to the Grotto, the very heart of the Sanctuary in Lourdes. Since the Blessed Virgin Mary appeared there to Saint Bernadette Soubirous in 1858, the Grotto has attracted millions of pilgrims. The Catholic Association pilgrimage processing to the Grotto. The Virgin Mary asked St. Bernadette to tell the priests "to come here in procession"; clergy processing to the Grotto for Mass. Bishop Paul Hendricks of Southwark Archdiocese preaching at the Grotto Mass. Bishop Paul preached powerfully at the Grotto. The Glanfield Children's Group at the Grotto Mass. At the offertory, children of helpers on the pilgrimage presented a collage 'rosary' made of photos of their faces, and a large rosary they had made from plastic balls. At the offertory the Glanfield Children's Group and the Helpers' Children's Programme brought to the altar some artwork they had made. Glanfield Group members with the artwork they had designed. After Mass it was time to pose for the annual photograph of the whole Catholic Association pilgrimage, and for photos to be taken of some of the groups whose membership is drawn from across the C.A. After the Grotto Mass the whole pilgrimage posed for a photo. The Carmelite group gathered around the Prior Provincial, Fr. Wilfrid, and the British Province banner carried by Jean Saunders. 'With Bernadette, praying the rosary". took a small group to visit the monastery of Carmelite nuns in Lourdes. all the way from Melbourne, Australia. On Monday afternoon the Catholic Association pilgrimage celebrated a Reconciliation Service in the beautiful surroundings of the Rosary Basilica. The presider was Fr. Wilfrid McGreal, Prior Provincial of the British Province of Carmelites. with fellow Carmelite group member Shell Roca (in front) signing for the deaf. Fr. Wilfrid preaching at the Reconciliation Service. as a time of deep encounter with God's love and mercy. Fr. Wilfrid hearing the confession of a fellow priest. as a reminder of our forgiveness in baptism. Later on Monday afternoon the Stations of the Cross were led by Jesuit priest and Bible scholar Fr. Nicholas King, in the cool of the Prairie meadow opposite the Grotto. Fr. Nick spoke powerfully to younger and older pilgrims alike. Fr. Nick is a helper on the Catholic Association pilgrimage. to look for parallels in the life of St. Bernadette, and in their own lives. Immediately after the Stations of the Cross, the Assisted Pilgrims were invited back to the Accueil Notre Dame for a special Tea Party organised by the Helpers' Childrens' Programme (HCP). Tea and games were on offer at the HCP Tea Party. Enjoying refreshment and one another's company at the HCP Tea Party. On Monday evening there was a special service held in St. Joseph's Chapel for the members of the Catholic Association Hospitalité, that is, the confraternity which organises the practical care of Assisted Pilgrims, and which gives its members practical and spiritual formation, as well as a network of support and friendship. The new patron of the C.A. Hospitalité, Bishop Peter Doyle of Northampton Diocese, led the service alongside Carmelite friar Fr. Antony Lester, who is Chaplain to the Hospitalité. Bishop Peter welcoming members of the Hospitalité to the evening service. The Hospitalité Service in St. Joseph's Chapel. the way in which the Hospitalité is a family. Carmelite group member Nimal Hemelge spoke as Hospitalité Secretary for the last time before handing the duty on to another member of the association. In addition to the helpers who give physical care, the Catholic Association Hospitalité has a number of 'Prayer Members' who support its work by praying for the helpers. Assisted Pilgrims are invited to become Prayer Members after they have been on the Catholic Association pilgrimage for a number of years. On this occasion one new Prayer Member was admitted to the Hospitalité, Carol Wilson. Carol is a member of the Carmelite group within the Catholic Association. She lives in a residential centre run by the Daughters of the Cross, who put her in touch with the Carmelites some years ago. as a Prayer Member of the Hospitalité. Carol Wilson (seated), surrounded by (left-right): Sr. Maureen McNally, FC (Carmelite group nurse), Nimal Hemelge (Hospitalité Secretary), Bishop Peter Doyle (Hospitalité Patron), Chris Buller (Hospitalité President), Fr. Antony Lester (Hospitalité Chaplain) and Claudette Verster (Carol's carer in Lourdes). After the Hospitalité Service there was a drinks reception in the Foyer of the Lourdes Hospitalité (HNDL). C.A. helpers enjoying some social time together. On the Tuesday morning of the Catholic Association (C.A.) pilgrimage, the various constituent groups and dioceses celebrate their own Masses. For the Carmelite group this year's Eucharist was particularly poignant because it included Brother Gerard Walsh's institution in the ministry of acolyte. being taken by young helpers to the Carmelite group Mass in St. Patrick's Chapel. Fr. Antony Lester, O.Carm., proclaiming the Gospel at the Carmelite group Mass. The prayers of intercession were led by Hugh and Margaret Parry, friends of the Carmelite Family. During Mass the group prayed for Carmelite individuals and communities in Britain, and remembered all the members of the British Province who have died in the last year. Brother Ged has been in formation as a Carmelite friar for a number of years, and in October will be making his Solemn Profession of Vows. He is also training to be a priest, and being made an acolyte is the final stage before he is ordained deacon in the coming months. The Prior Provincial of the British Province of Carmelites, Fr. Wilfrid McGreal, O.Carm., presided at the Mass and preached about the centrality of the Eucharist in the Christian life. He explained that the ministry of acolyte is an invitation for Ged to share more fully in the ministry of the Church, serving the Body of Christ both at the altar during worship and in Christ's Mystical Body, God's holy people. Fr. Wilfrid blessing Br. Ged for his service as an acolyte. Fr. Tony Lester giving Fr. Wilfrid the paten and chalice to present to Br. Ged. Br. Ged was given the vessels containing bread and wine to be consecrated during the celebration of the Eucharist. Part of the role of an acolyte is to assist with the distribution of Holy Communion. According to the Rite of Institution, Br. Ged now has the responsibility 'to assist priests and deacons in carrying out their ministry, and as a special minister to give Holy Communion to the faithful at the liturgy, and to the sick'. Brother Ged has been serving the sick and disabled in Lourdes for many years, and was delighted that his institution as an acolyte could happen there. Words addressed to the acolyte in the Rite of Institution make a strong link between the sick and the Eucharist: "In performing your ministry bear in mind that, as you share the one bread with your brothers and sisters, so you form one body with them. Show a sincere love for Christ's Mystical Body, God's holy people, and especially for the weak and the sick." To watch video footage of the Mass, click on the arrow in the YouTube box below. After the Carmelite celebration of Mass the pilgrims posed for a group photograph. The Carmelite group photographed by Durand. The Carmelite pilgrims concluded the morning by going for coffee together. Carmelites and friends sharing a moment of relaxation together. Lay Carmelites Charmaine Jayasuriya and Monica Spalding enjoying coffee with a young helper from the Catholic Association. On Tuesday afternoon pilgrims had the possibility of joining excursions into the Pyrenees mountains. Volunteers working in the Accueil Notre Dame and hotels swapped over for the second half of the week. A briefing for the new team coming to work in the Accueil Notre Dame. In the evening a number of Carmelites joined the Glanfield Children's Group for night prayers on the terrace of the Hotel Mediterranee. The Glanfield Group ends each day with a short and simple time of reflection. On the morning of Wednesday 29th August the Catholic Association pilgrimage went en masse to the famous baths ('piscines') in the Lourdes Sanctuary to pray and wash in the water as St. Bernadette did in 1858. After lunch the pilgrimage celebrated a lively Mass that was organised by children. It was particularly special as it marked the 25th anniversary of the establishment of The Glanfield Group which brings sick and disabled children and adults with learning difficulties to Lourdes. The Glanfield Group gathered for the Mass organised by children. for the Mass organised by children. Vibrant music at the Mass organised by children. Children from the Glanfield Group and the Helpers' Children's Programme acted out the Gospel story of Jesus calling his disciples and entrusting them with spreading the Good News. The three bishops taking part in the pilgrimage sprinkled the congregation - and each other - with water as a sign of renewed baptismal commitment to following Jesus Christ. Children in fancy dress holding the water containers for the bishops. Children animated different parts of the Mass, leading the congregation in prayers and hymns with actions. Members of the Glanfield Group singing and gesturing "Here I Am Lord"
Children leading the bidding prayers. Pilgrims reaching out in prayer. Children and adults sharing the sign of peace. Children and the young-at-heart united in prayer. The Mass ended with a rendition of the popular children's hymn "Rise and Shine"
Fr. Tony Lester, O.Carm., at the Glanfield Group party with fellow Carmelite pilgrims, in discussion with a Canadian PhD student who is researching modern-day pilgrimage. with Glanfield Group stalwart Errol Bracken. Wednesday afternoon was a chance for pilgrims to relax a little. In the Accueil Notre Dame a stretcher and projector were rigged-up for showing residents the Olympic Games Opening Ceremony and a film. A chance to relax at a temporary cinema! Relaxing with friends was the order of Wednesday evening with the Carmelite Group social held in the Hotel Gallia & Londres. This was a chance for members of the group to enjoy a drink with guests from the wider Catholic Association pilgrimage. Many friends of the Carmelites from the wider pilgrimage joined the celebration. Carmelite group assisted pilgrims and helpers relaxing together at the party. relaxing after a full day's work serving pilgrims. chatting at the party with Bishop Declan Lang of Clifton Diocese. The Carmelite Prior Provincial, Fr. Wilfrid McGreal, spoke at the party of how glad he is that the Carmelites are in partnership with the Catholic Association and thanked all those who make the pilgrimage possible. as an acolyte during the pilgrimage. at the party with Lay Carmelite Charmaine Jayasuriya. Carmelite group members Jean Saunders (left) and Charlie Thermos. Jean had travelled from Ireland to take part in the pilgrimage, and Charlie from Australia. Mary Okeke (right) and Joan Agba (centre) are volunteers from the Carmelite-served parish of English Martyrs in the London borough of Walworth. To read a report of the previous day please click here. To read a report of the following day please click here. On Thursday 30th August the Carmelites and other groups of the Catholic Association (C.A.) celebrated together the Sacrament of Anointing of the Sick during a morning Eucharist. Bishop Peter Doyle of Northampton Diocese presided at the Mass. Bishop Peter preached powerfully about the Sacrament of the Sick. Priests laid hands in prayer on those receiving the Sacrament of the Sick. Bishops and clergy prayed with outstretched arms for the healing of the sick. being blessed for the Sacrament of the Sick. anointing a member of the Carmelite Third Order. After lunch the pilgrimage gathered again in the St. Bernadette Church for a closing Service of Thanksgiving. 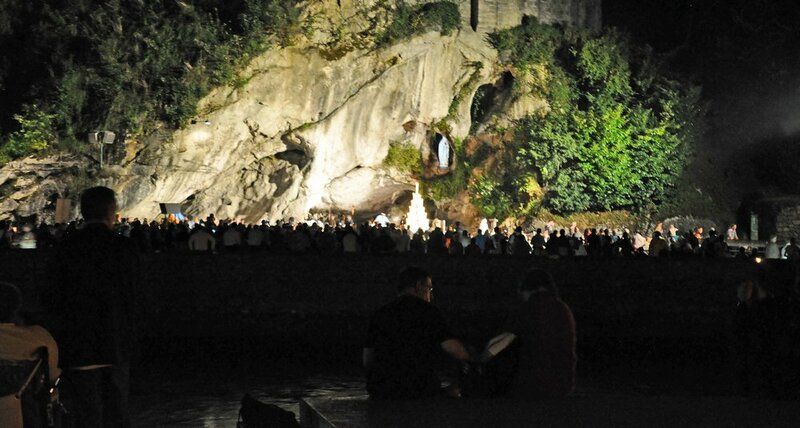 Pilgrims thanked God for the graces received during the week in Lourdes. Deacon David Wakefield, Director of the Clifton Diocesan Group. Bishop Declan Lang preaching at the Thanksgiving Service. Bishop Paul Hendricks, Chair of the Catholic Association, thanked those outgoing volunteers who have served in various official capacities on the pilgrimage. At the end of the Thanksgiving Service the banners of the dioceses and groups that participate in the Catholic Association pilgrimage gathered on the sanctuary steps before processing to the Grotto. Dioceses and groups united as a single pilgrimage. Pilgrims processing from the St. Bernadette Church to the Grotto. The Carmelite banner in the procession to the Grotto. Processing over the River Gave to give thanks at the Grotto. The procession headed for the Grotto, the very heart of Lourdes. Having processed from the St. Bernadette Church over the river, there was an opportunity for Assisted Pilgrims to make a 'passage through the Grotto', praying for the last time during the pilgrimage at the place where the Blessed Virgin Mary appeared in 1858. The pilgrimage banners in front of the Grotto. As the pilgrims approached the Grotto the heavens opened! Being in the foothills of the Pyrenees, Lourdes is often subject to heavy rain. to Our Lady, and to fellow pilgrims at the end of the pilgrimage. During the passage through the Grotto, the Carmelite group was able to deposit the many petitions (prayer requests) that had been submitted by post and by email by members of the Carmelite Family in Britain and around the world. handing petition slips to a volunteer at the Grotto. The hood of Brother Tony's habit offered some protection from the rain! of the whole Catholic Association. Thursday evening ended with a party in the Accueil Notre Dame for Assisted Pilgrims and their helpers. 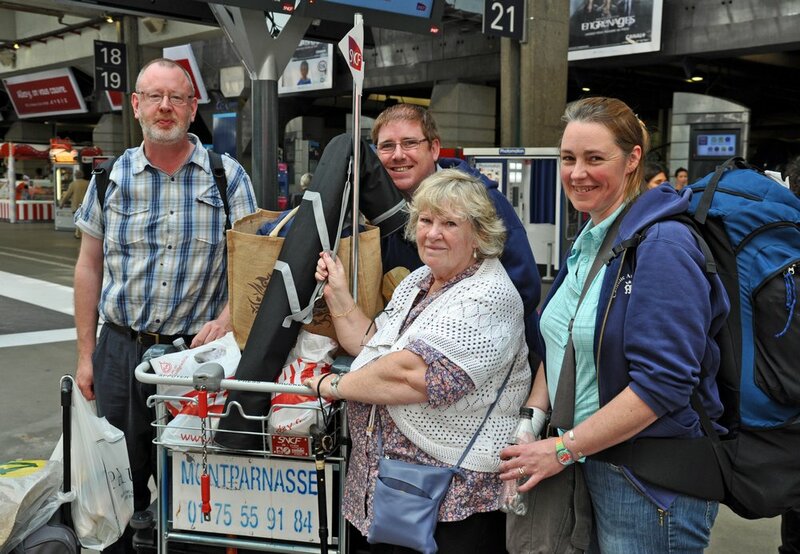 After a wonderful week's pilgrimage in Lourdes, on Friday 31st August it was time for the Catholic Association and its partner groups, including the British Province of Carmelites, to pack-up and head for home. Assisted Pilgrims in the Accueil Notre Dame were woken by helpers at 5am in order to be ready for early flights. The final morning in the Accueil Notre Dame. The last morning of service in the dining room. the last things to be packed away at the end of the pilgrimage. Getting all the luggage and equipment out of the Accueil and on the right transport home can be a real logistical challenge, but one which the Carmelite and other helpers rose to! Most pilgrims were on early flights or trains, but for those staying a little longer a final Mass was celebrated in the St. Bernadette Church, not far from the monastery of Carmelite nuns in Lourdes. Servers and clergy processing into the final Mass. a Southwark priest and pilgrimage director of the Catholic Association. Those at Mass prayed for those whose journey home had already begun. Meanwhile, Assisted Pilgrims travelling home waited for a short time in the transit lounge on the top floor of the Accueil Notre Dame. A last chance for APs and their carers to chat in the transit lounge. Both Assisted Pilgrims and their helpers are changed by their experience of Lourdes. Phyllis Kelly, one of the Assisted Pilgrims in the Carmelite group, who comes from the Carmelite-served parish of English Martyrs in Walworth, south London. Rose Aqui, another Assisted Pilgrim in the Carmelite group from Walworth. Mike Elmore, an Assisted Pilgrim from Peterborough. Waiting patiently for the transport to Lourdes airport. Pilgrims to Lourdes can become friends for life. in specially adapted buses known as 'fourgons'. Pilgrims on board the fourgon giving a fond wave goodbye to Lourdes. Members of the Carmelite team waving off the APs in the first fourgon. Just as Carmelite group volunteers had been the first to arrive and set-up in the Accueil, so they were the last to leave, having carried out various final tasks. of the Carmelite group take a deep breath after the last APs leave the Accueil. before their overnight coach journey back to Britain. The Carmelite advance party made its journey home on Saturday 1st September. As the train pulled out of Lourdes and passed the Grotto, the Carmelites said a final 'Hail Mary' in thanksgiving for a wonderful week. Already planning has begun for the 2013 Carmelite pilgrimage to Lourdes with the Catholic Association, which will take place between 23rd and 30th August.